Have you heard about green smoothies? They seem to be ubiquitous in Pinterest land, but whenever I start trying to tell my friends, they think I’m totally crazy. Basically, they’re a step up from normal smoothies as they have greens (usually spinach or kale) blended into them too. 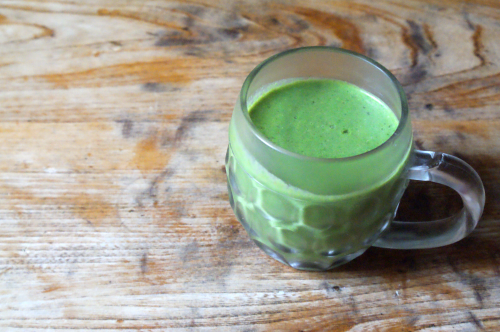 Before you click away in disgust, it’s not actually that weird, you can’t even taste the greens! I either have a smoothie for breakfast or take it to work as a snack. I like the fact that I’m getting some extra veggies as some days are frankly a struggle to get any. Also, my toddler loves them. Below is my current favourite recipe. I make it with almond milk, peanut butter and some frozen mango to sweeten – I like to think of it as a green milkshake (ha!). Btw, if you’re into making smoothies, buy your fruit frozen! It’s so much cheaper than buying fresh, especially berries. Also, frozen fruit makes really refreshing smoothies, kind of like a slushie. Put everything in a blender and blender for a minute or two. You need to blend it for a long time to get a smooth smoothie. Also, I let my mango defrost a little as my blender can’t really hack frozen fruit. There are MILLIONS of other recipes out there – but these variations sound fun as a starting point and I like this recipe.